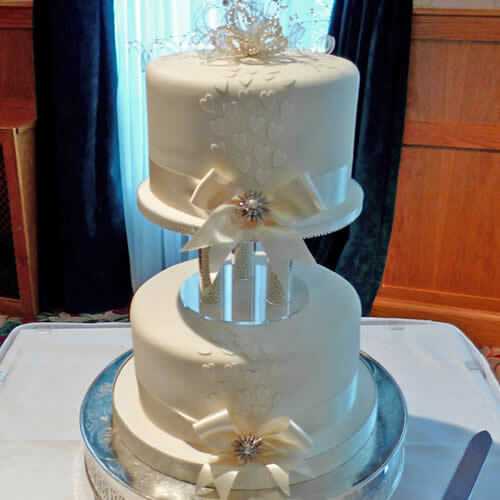 The bottom tier is a 9" sponge cake, and the top tier a 7" sponge cake making it an ideal size for around 50 - 70 guests. Each tier of this beautiful cake is decorated with a wide satin ribbon around the base and finished with a lovely vintage brooch. The tiers are then stacked using a beautiful tubular separator, partially filled with small pearls and small sugar heart motifs are applied in cascades down the front of each tier. The cake topper on this vintage-style cake comprises of pearl loops, diamante sprays and coils of silver-edged ribbons.